Descr. Cact. Nov. 226. 1936 [12 Feb 1936] Backeb. Origin and Habitat: Córdoba (Patagonian Andes), in central-west Argentina. Altitude range: 500-1400 metres above sea level. 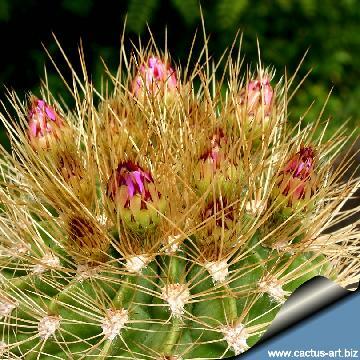 Description: Acanthocalycium spiniflorum f. violaceum (lilac flower cactus), best known as Acanthocalycium violaceum , is one of the forms of Acanthocalycium spiniflorum which is a widespread and morphologically variable taxon. 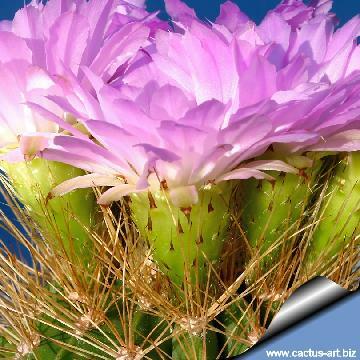 It is a globular to elongated cactus about 10-15 cm cm wide in time but will seldom offset. 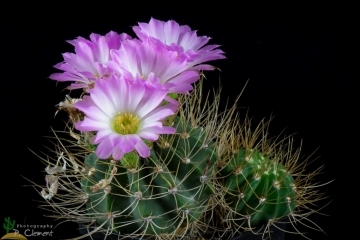 It is distinguished from the type species for its delightful pale-lilac flowers and ribbed body armed with dense yellow or honey-coloured spines, but most botanist agree on the fact that all the varieties described until now should all be included in the Acanthocalycium violaceum . The flowers appear most heavily in spring and summer. There are also forms with white flowers and the yellow spination can be sparse or more dense and long. Stem: Solitary to slowly clumping, globular to elongated, 20-60 cm tall, 10-15 cm thick, pale green to dull green. Ribs: Numerous, 15 to 20, acute, 1 to 1.5 cm high notched, at the areoles. Areoles: 1.5 to 2 cm apart, round, whitish when young, rather large. Spines: 10-12 (-20) per areole, dense, thin to strong, needle-like, straight or curved, more or less spreading, yellowish to honey-coloured (or pale-brown) up to about 3 cm long. Central spines 3 or 4, developing later, yellow tipped brown, up to 4 cm long. Flowers: Trumpet-shaped, erect, somewhat variable from one plant to another, mostly light liliac-violet but sometime almost white 4 cm to 7,5 cm long and long and c. 6 cm wide, and appear in a ring close to the apex during late spring and summer. Ovary and tube with pointed spinescent scales and whitish hair or wool; the inner petals of a tender violet colour, hairy at the throat. Blooming season. Late spring to early summer. It starts blooming at around 8 cm in diameter. 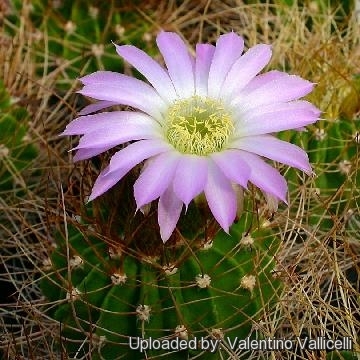 Acanthocalycium spiniflorum f. violaceum (Werderm.) 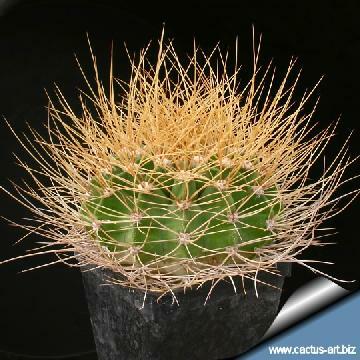 Donald: has pale-lilac flowers and ribbed body armed with yellow or honey-coloured, spines. Distribution: Córdoba, Argentina. 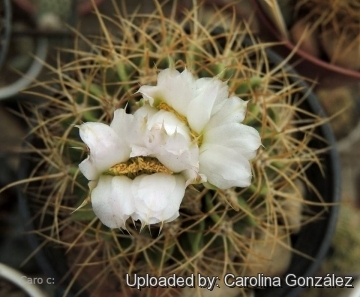 Notes: The feature distinguishing Acanthocalycium from its relatives is the spiny bud which gives it its name. 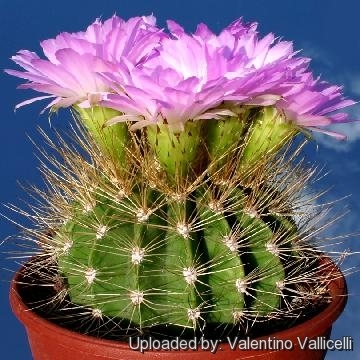 Cultivation and Propagation: Acanthocalycium spiniflorum f. violaceum belongs to a group of very easily cultivated plants, even during winter the plant is attractive, and the stout yellow spines show up well against the dark green of the stem. 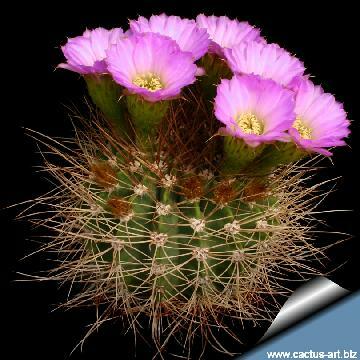 The violet flower of this form is unusual in the family Cactaceae, making it a popular plant to cultivate. 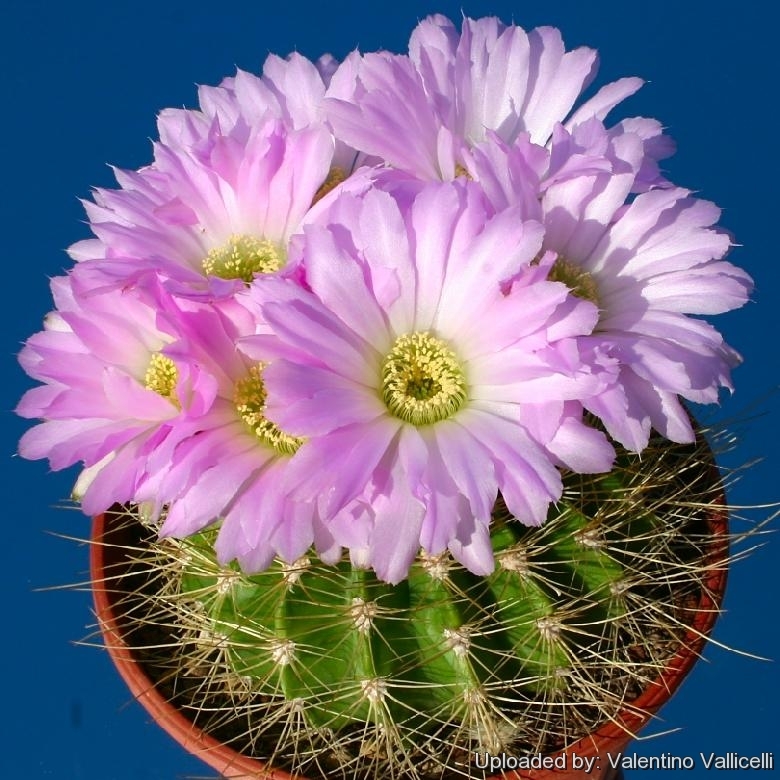 It is more cold tolerant than most cacti and less fussy regarding soil conditions. It is the most commonly encountered species, and perhaps the most attractive. The flowers are somewhat variable from one plant to another, sometimes being almost white, so it is advisable either to purchase a plant in flower or to grow several from seed to select a good liliac form. Growth rate: It is a relatively rapidly growing and easily flowering species. The larger these plants are when they placed in the garden, the more likely they are to survive. They are much more vigorous in the garden if they are not allowed to remain dry for long periods during the growing season. Propagation: Direct sow after last frost. Seeds germinate in 7-14 days at 21-27° C in spring, remove gradually the glass cover as soon the plants will be well rooted (ca 1-2 weeks) and keep ventilated, no full sun for young plants! This cactus does not offset easily, certainly not as a young plant; many apparently solitary plants do occasionally form offsets with age.